You know who did spend a lot of time thinking about bicycles? H.G. Wells! Not just him, but many science fiction writers in the Victorian era. What was so special about the bicycle, and how did it influence Steampunk? Glad you asked! We don't often think about it today, but the bicycle was a huge advance in technology when it was first developed in 1817. 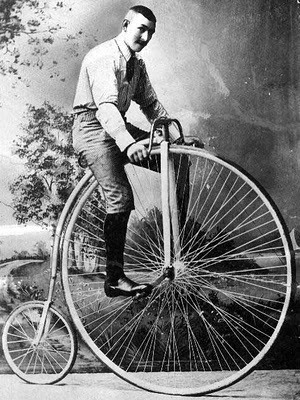 Not only that, but early bicycles looked pretty damned Steampunk, and I'm not even talking about the penny-farthing picture below. 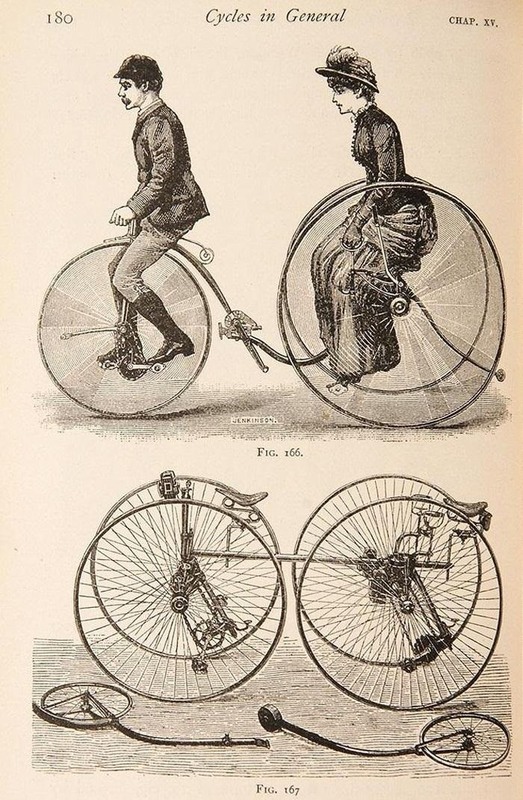 No, before the two-wheeled design was finally settled on, the bicycle went through a whole host of alternate designs. After all, who wanted to precariously balance atop a two-wheeled contraption? It was most unseemly to fall over! Pretty cool, right? Bicycling basically took the world by storm, because it allowed people to travel much greater distances than usual while still being both fast, and cheap. You didn't have to own and maintain a horse in order to travel between towns in only a short time, and this had a profound effect on the imaginations of writers, in particular H.G. Wells. Wells was an avid fan of cycling, and even wrote a book that most people have never heard of that was entirely about bicycling. 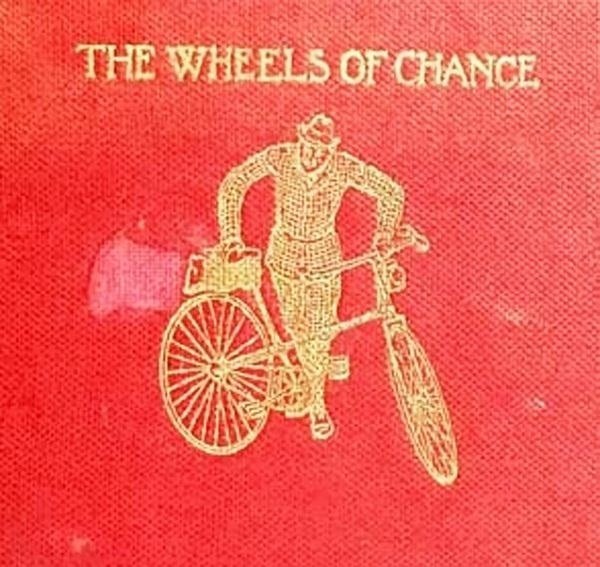 It was called The Wheels of Chance, and it was a somewhat comic novel about a gentleman who takes a cycling holiday. While it may not seem obvious, bicycles affected science fiction far more than we think. For many at the time, the invention of the bicycle (far more than the locomotive) inspired people to think about alternate methods of transportation in general, not specifically related to the bicycle itself. For example, H.G. 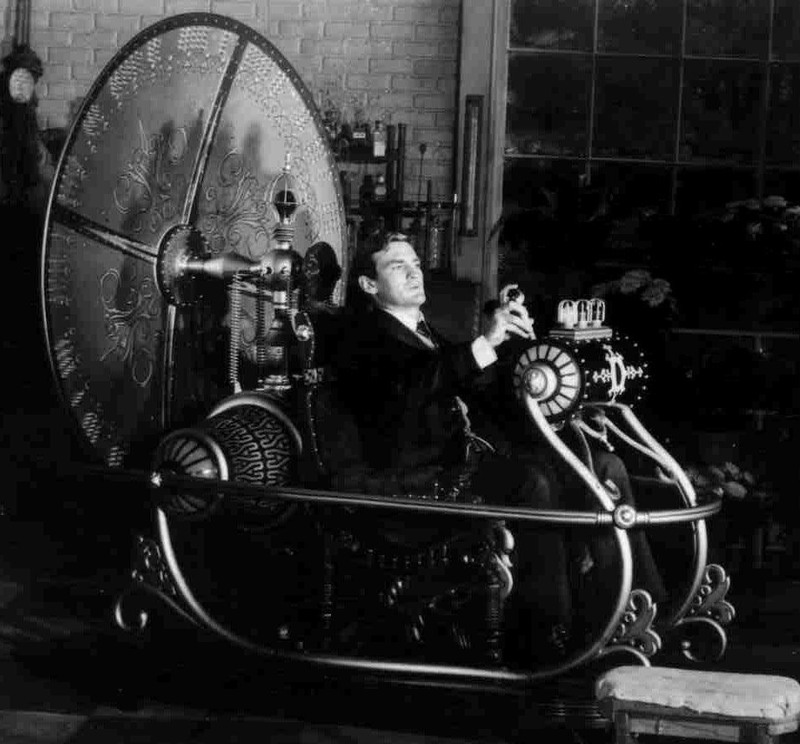 Wells's The Time Machine was based not on a bicycle, but on a tricycle. 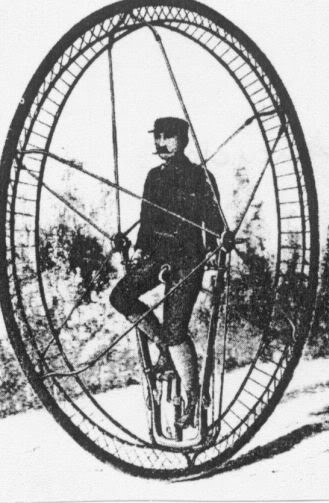 At the time Wells was writing The Time Machine, his balance wasn't steady enough to successfully ride a bicycle, so he had taken to riding a tricycle. 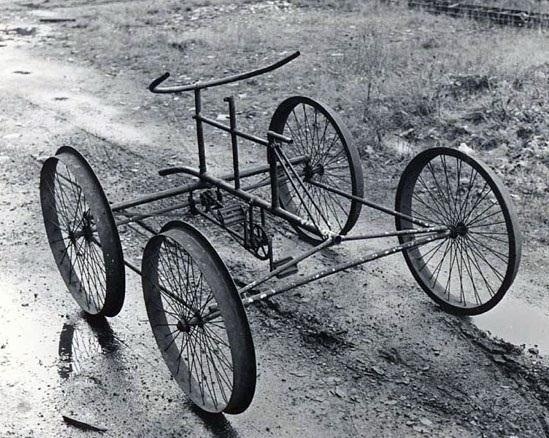 Remember that tricycles at the time weren't seen as things for children, but were perfectly acceptable alternatives to their two-wheeled brethren. So if you read the actual description of the time machine itself, it makes much more sense when you think of it as looking like a tricycle. He describes it as a "glittering, metallic framework" with a "control bar" and a "saddle". Sounds more than a little like a tricycle, doesn't it? Sometimes I like to imagine a young H.G. Wells riding his tricycle across the countryside, imagining himself traveling forward in time. In fact, I wonder whether the inspiration for such a devolved, dystopic future comes from his rides from the city into the countryside, as it would be easy to see the works of man fading slowly away into nothing as he left civilization behind. While Wells is the best example of a science fiction writer who was influenced by bicycles because his love of them was so well-documented, he represents merely the tip of the iceberg, so to speak. The bicycle started a personal transportation revolution, and nearly every example of fantastic methods of transportation in Victorian science fiction owe a debt to either the locomotive, or the bicycle. 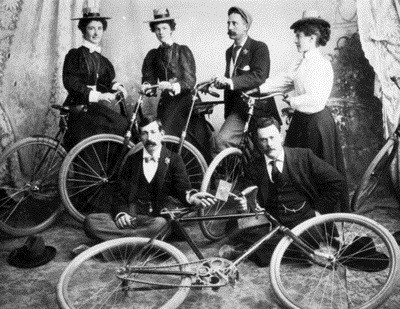 Next time you're putting together a Steampunk outfit, consider the role of the humble bicycle in the development of the genre. Sometime I'd love to see not an airship pirate, but a bicycle pirate! Images from Laura Massey, Jackie Pennington, Fin de Siecle, The Online Bicycle Museum, Filmophilia, Freshet, The Weasel on Wheels, and Chris Morton.